Fur coats in the fall has kind of a funny history. American college kids in the 1920s began sporting heavy, full length raccoon coats. It started a trend that gained so much momentum and popularity that it did not matter if you were a student or a salesman, working in a bank or playing on the bandstand, you would not have been seen out and about without one. The Raccoon Coat craze was so big that it permeated into pop culture with the 1928 hit song “Doin’ The Raccoon” by George Olson. 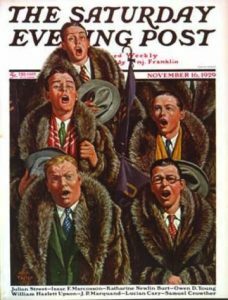 And just months after that, ‘The Saturday Evening Post’ featured a cover illustration of five collegiate “Singing Men in Raccoon Coats”. Fall is the season of back to school, and fur fashions are just as popular today as they ever were in the Roaring 20s. And for all of us don’t want to wear a full length raccoon fur coat, the options of adding fur are now endless! 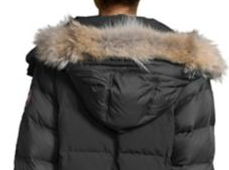 Fur trims and accessories abound, from the ever popular coyote fur trim on parka hoods to the most recent must-have fur fad, the fur pom-pom key chain. I’ve even recently seen some fantastic fox fur trimmed backpacks! Whether you’re back to the books or just getting ready for the seasonal wardrobe change, fur is a great way to add a little luxury to brighten your day as the sunsets are getting a bit sooner. If you are looking for a statement fur coat or an estate vintage-inspired fur, a hint of extravagance with some mink fur cuffs or going fully out for the Fall Varsity Fashion Team, look no further than Mano Swartz!